Met Éireann has issued a Status Yellow wind warning for the entire west coast as stormy conditions are expected to hit most of Ireland over the course of Thursday and Friday. The warning was issued for all of Connacht, Donegal, Kerry, Clare and Limerick. It is in place from 10pm tomorrow until 9am Friday. Wind speeds are expected to reach between 55 to 65km/h with gusts of 90 to 110km/h. According to forecasters, rain is expected to be heaviest in Leinster and Ulster. Tonight, the rain will develop in the west and spread across the country. The national forecaster says "stormy conditions" are in store for later in the week with hail and thunder also on the cards. Temperatures are also due to drop as low as -2 degrees, so motorists are being urged to take care as frost and ice are expected to develop. Rain will develop in the south overnight and continue northwards over the country, turning heavy at times with a risk of spot flooding in the south. Scattered, blustery showers are in store for Friday with a risk of hail and thunder. Meanwhile, this weekend also looks set to be miserable with more rain and showers moving in from the Atlantic on Saturday afternoon. 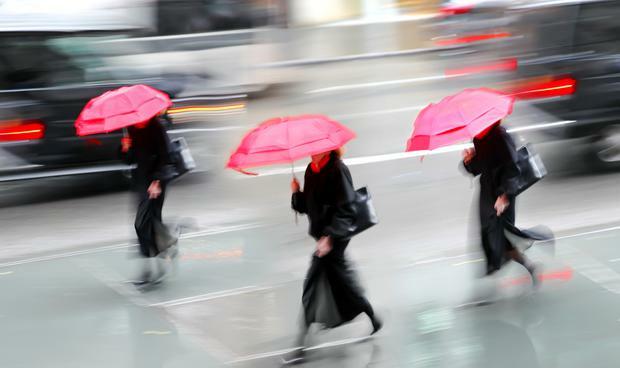 For those heading out on Saturday night, Met Éireann warns that a windy night is in store, while Sunday will see a slight improvement with showers becoming increasingly isolated and northwesterly winds gradually moderating.